Brent Snider, manager of the Sawtooth Fish Hatchery, holds one of 22 sockeye salmon caught near Redfish Lake last Sunday. 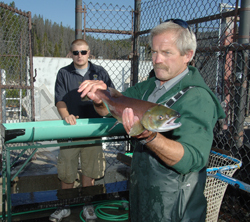 Standing behind Snider is Brian Ashton, a biologist aide at the Eagle Fish Hatchery, headquarters for the state’s captive breeding program for Redfish Lake sockeye. Is more pot growing in Camas? FOOL of the Year—a big honor! Why no outrage about corporate cubicles of death? Are we friends to the landscape?